A number of works seem to be recountings of things that they have seen at some point and remembered — stuck with them, if you will. 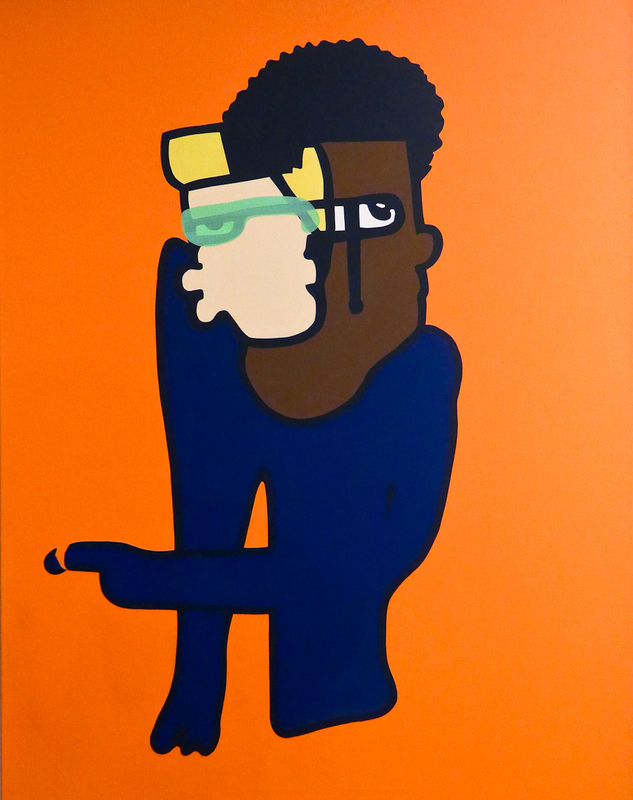 However, rather than mimicking or parodying imagery, they bring together disparate sources to create something new. 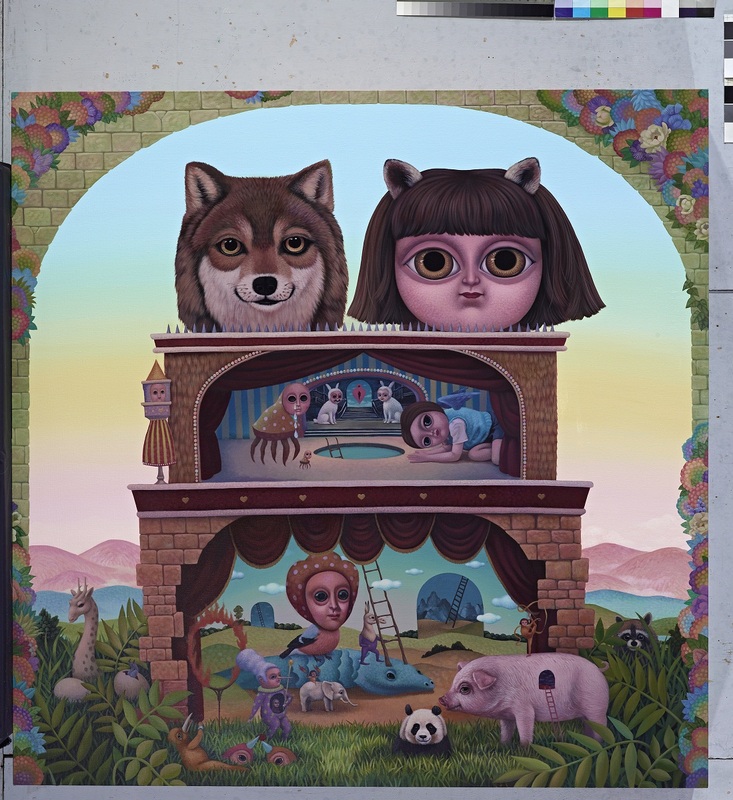 For example, Henri Rousseau’s jungles, Salvador Dalí, Bylthe dolls can be seen in Chang Chia-ying‘s (張嘉穎) The Wolf and A Fairy Fox at the Magical Theatre. Hsiao Chu-Fang (蕭筑方) appears to appreciate Picasso and MS Paint, and Yen Yu-Ting (顏妤庭) brings playfulness to two brilliant re-imaginings of Chinese shanshui paintings. HER Gaze second floor installation view. Photo by Andrew Shiue. 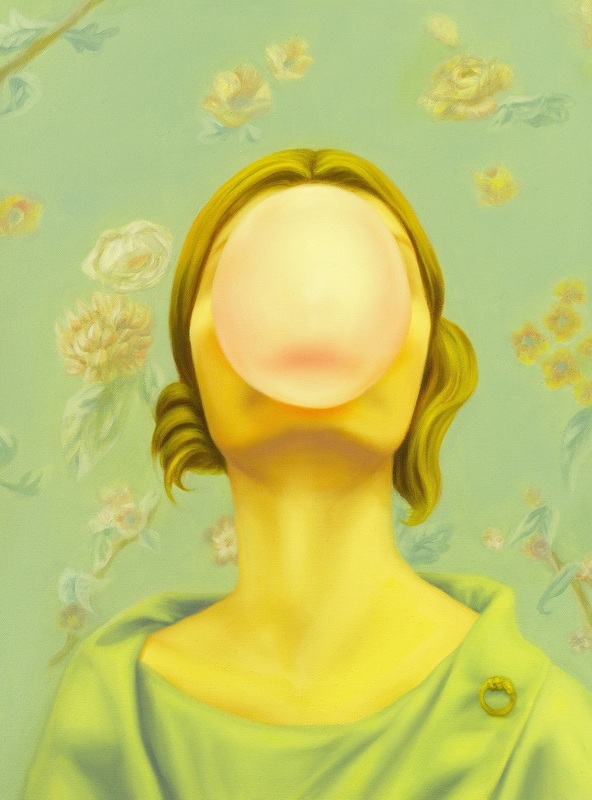 Joyce Ho (何采柔) takes the surrealism out of Magritte’s The Son of Man and The Great War on Façades and complicates the idea of being hidden with the display of bubble blowing talent in Survival Instinct. 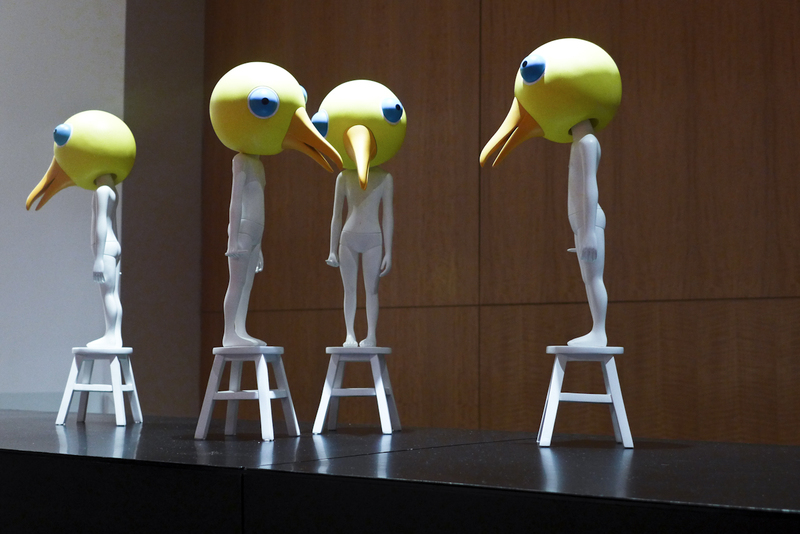 She continues this pondering of self and appearances with an untitled sculptural set of a flock of bird people perched on a wall and Invisible. Contrasting this introspection are the seething raw emotions of Colors for you and Nonchalance to him, a pair of paintings by Hsieh Yi-Ju (謝怡如) with messy psychedelia of impressionistic colors, and Chang En-Tzu‘s (張恩慈) Perfect Imperfection which upends both the craft of embroidery and the Snow White fairy tale with a violent tangle of thread in what looks like the aftermath of an outburst. Here, a flower with roots in our three dimensional world gags a terrified Snow White, while in the outlined background, her prince charmingly smiles at another woman with closed eyes and a half-raised hand. The form and imagery stun. Artwork frequently invites interpretation, but Ho Szu-Wei (何思瑋) and Huang Hai-Hsin (黃海欣) invite stories. Ho Szu-Wei’s intricate Blue Egg and The Child with Rabbit Ears (a dense work tinged with Edward Gorey and Shel Silverstein) deserve equally imaginative tales to accompany them. Meanwhile, Huang’s uncanny painted snapshots visualize anecdotes (real, fictional, and absurd) told to friends, shared on social media, and remembered. In light of its curatorial conceit, should HER Gaze have conveyed a stronger sense of what it means to be Taiwanese or a woman? 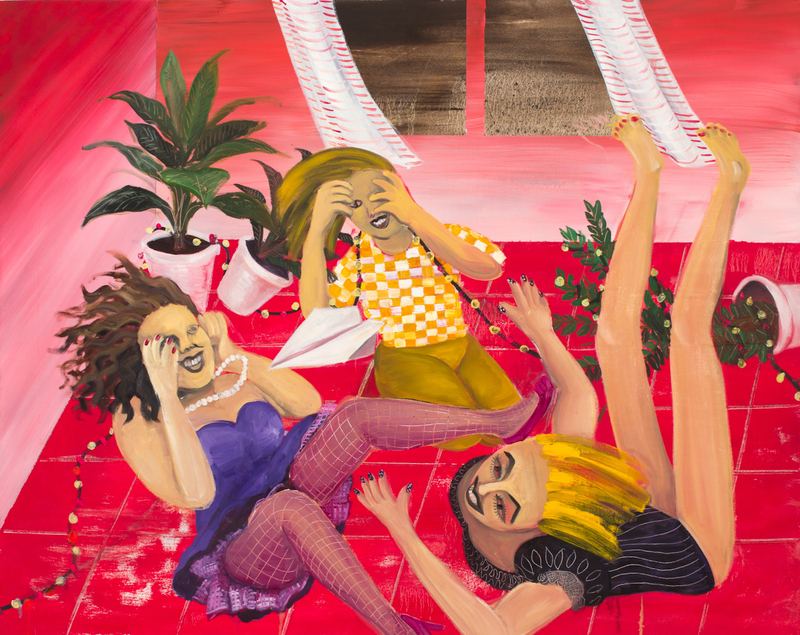 Saatchi Gallery’s Champagne Life all-female show was criticized for missing a discussion on gender. Cai Guo-Qiang said he didn’t include more women in his attempt to redefine Chinese artists (actually, it’s not them who need redefining) because he fails to see their methodologies. More information, such as their biographies, could have been provided about the artists, if there was a desire to emphasize a unifying theme. However, the exhibition serves the artists simply by allowing their individual interests, personalities, and thoughts to come through in a lively way. 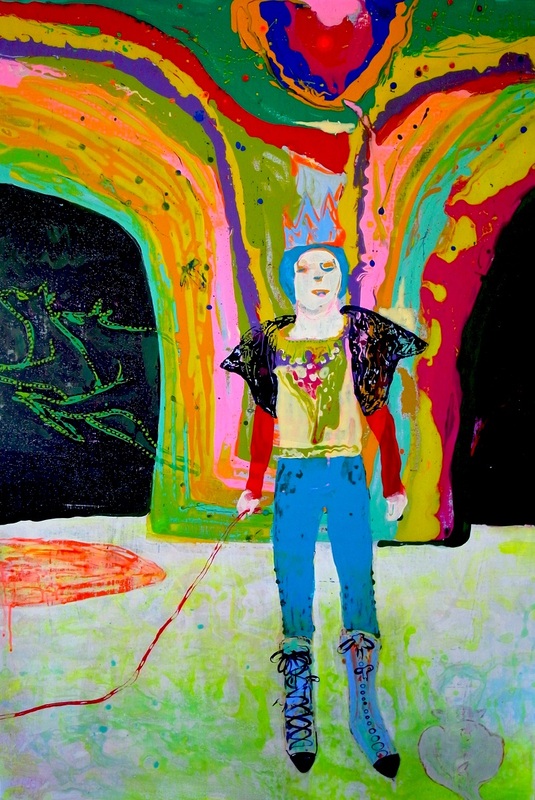 Chang Chia-Ying (張嘉穎) – The Wolf and A Fairy Fox At the Magical Theatre 《大野狼與小狐仙的魔幻劇場》, 2014. Hsiao Chu-Fang (蕭筑方) – Cubism 《立體派》, 2015 Acrylic on canvas, 130 x 97 x 5 cm. Photo by Andrew Shiue. 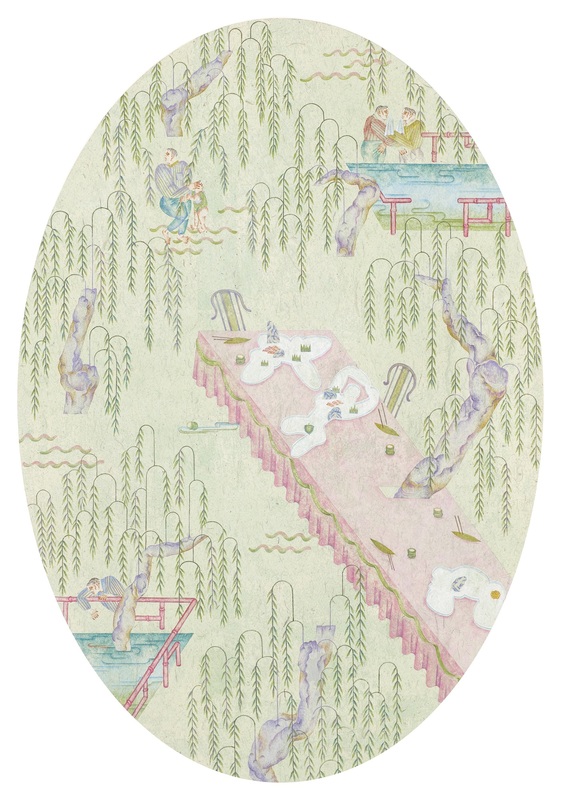 Yen Yu-Ting (顏妤庭) – Gathering under Rain of Willows 《柳下會》, 2015. Joyce Ho (何采柔) – Survival Instinct 《適者生存》, 2012. Joyce Ho (何采柔) – Untitled, 2010. Fiber reinforced plastic, wood, speakers. Photo by Andrew Shiue. 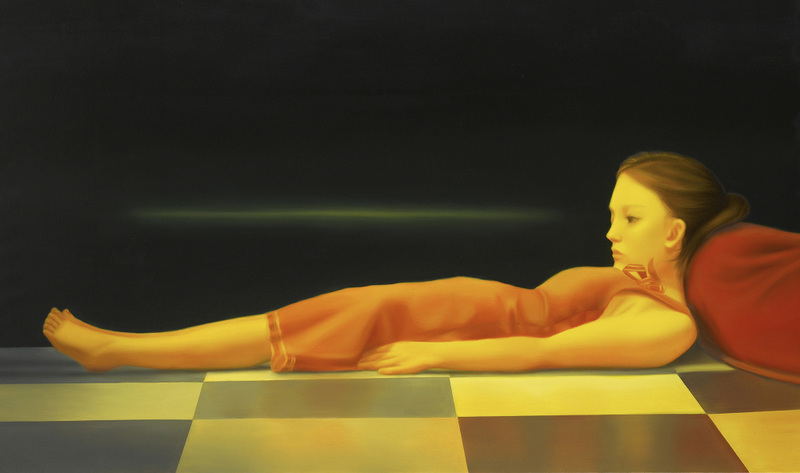 Oil on Canvas, 90 x 150 cm. Taken from artist website. 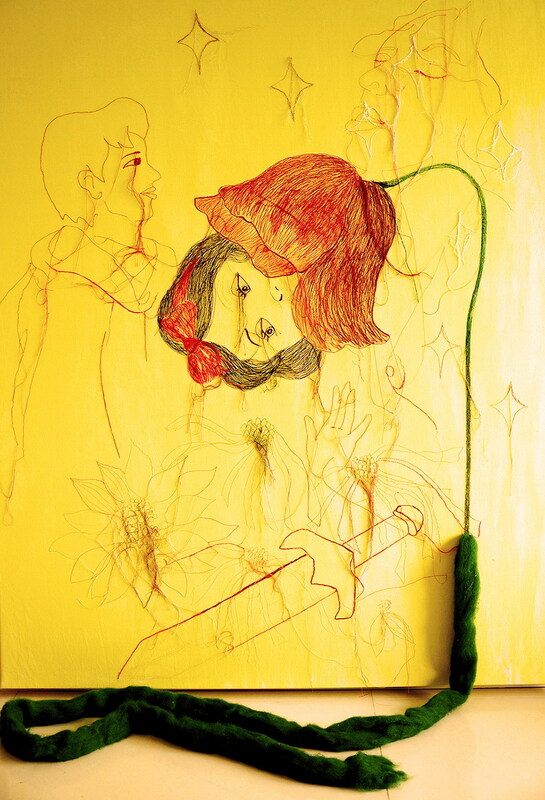 Hsieh Yi-Ju (謝怡如) – Colors for you, Nonchalance to him (right panel) 《顏色給了你 輕鬆給了他》, 2011. Chang En-Tzu (張恩慈) – Perfect Imperfection – 1 《不完美的完美》 – 1, 2013. 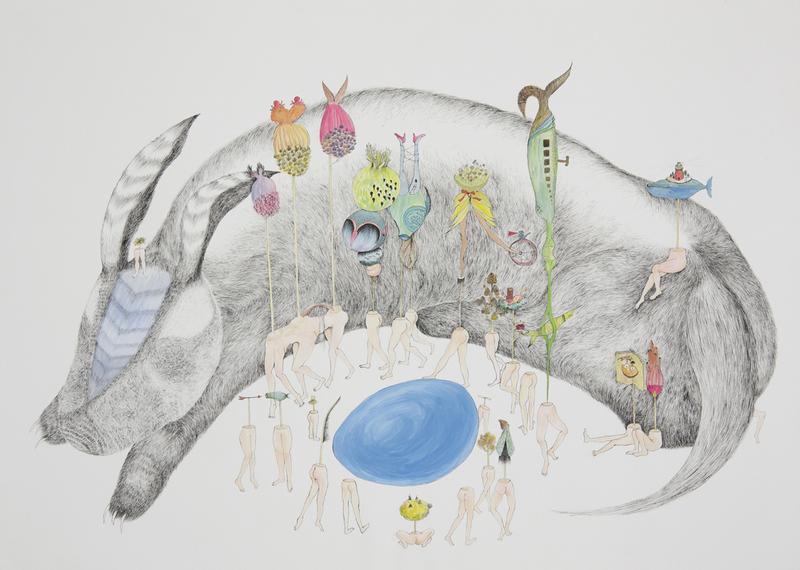 Huang Hai-Hsin (黃海欣) – Amuse Ourselves to Death 《娛樂致死》, 2013. 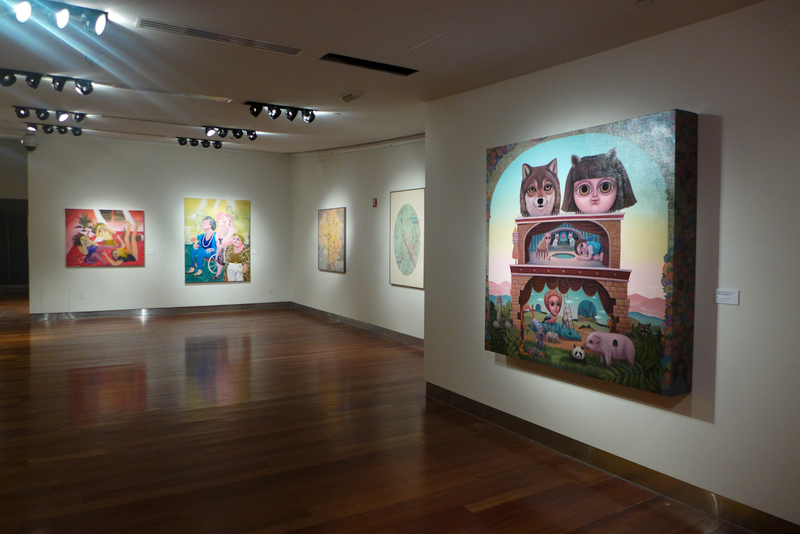 HER Gaze is on view at the Taipei Economic and Cultural Office, 1 E. 42nd Street, through March 30, 2016. Lead image: Joyce Ho (何采柔) – Invisible, 2010. Oil on Canvas, 90 x 150 cm. Taken from artist website. Images courtesy of Josiane Lai, except where noted.